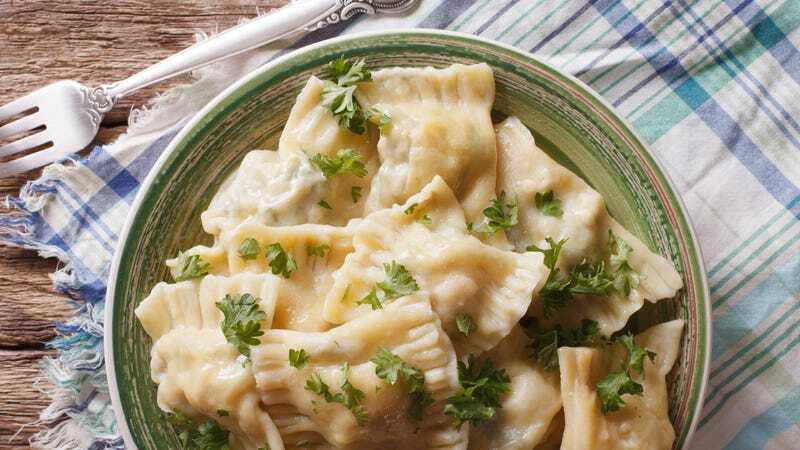 Like anyone with a pulse and a stomach, I love stuffed dumplings: tortellini, pelmeni, wontons, samosas, and—thanks to my heritage—maultaschen, an underappreciated German dumpling typically filled with meat and spices. Maultaschen are a lot like ravioli but bigger; they’re usually palm-sized, square pockets of pasta dough crimped at the edges. From there, the preparations are endless. The fillings run the gamut from savory to sweet, meaty to vegetarian, though a traditional combination is minced meat (veal, beef, or chicken, perhaps smoked), bread crumbs, onions, and something green like spinach, all seasoned with salt, pepper, parsley, and sometimes nutmeg. They’re often simmered and served with broth instead of sauce for a tender, creamier treat, but are sometimes pan-fried and buttered for extra richness, color, and a more toothsome texture. A tangy side like sauerkraut or a topping like quark (a German fresh cheese with a yogurt-like consistency) helps balance the lusciousness of the dish. Unlike ravioli, maultaschen are hard to find in the U.S. unless you live near a dedicated German restaurant like Bayern Brewing’s Edelweiss Bistro in Missoula, Montana, which sometimes offers them as a special, or Seattle’s Altstadt, which fills its fantastic maultaschen with chicken and spinach. Whenever I’ve visited family or lived and worked in Germany, I’ve loved the regional specialty, but I’d never considered making them at home, even though I’ve made ravioli, gnocchi, and other types of Italian dumplings before. So when I heard the completely bonkers origin story of maultaschen and found out a 12th-century Cistercian monastery in Southwest Germany was offering a workshop in making these pasta pockets, I had to make Maulbronn a stop on my next European trip. Maulbronn exists because of the UNESCO World Heritage site Maulbronn Monastery (Kloster Maulbronn, in German), founded in 1147 and regarded as the best-preserved monastery north of the Alps. A small town in the state of Baden-Württemberg—home to the Black Forest and heavily influenced by its proximity to the Alsace region of Northeastern France—Maulbronn is about 90 minutes south of Frankfurt by car or, if you’re staying without a car in Karlsruhe as my partner and I were, about 90 minutes east by train and bus. Transferring to the bus in Pforzheim, we were greeted by a billboard advertising packaged dumplings from the brand Bürger with the slogan “Maultaschen gehen immer!” or “Maultaschen are always a great choice!” This seemed like a good sign, literally. It was an easy journey and—aside from the stretch in Pforzheim, which was destroyed in World War II and rebuilt in a somewhat bleak post-war fashion—an idyllic ride, with our bus taking us past rolling hills and adorable towns that seem seem frozen in time around the era when Belle was meeting the Beast. Once we reached Maulbronn it became obvious how inseparable the beautiful former monastery and the town are. Cistercian monasteries, located in fertile valleys, were historically powerhouses of culinary trade thanks to their hundreds of laborers toiling in farms and vineyards. But the limited number of prayerful monks themselves ate a frighteningly austere diet in the best of times: a strictly measured pound of bread a day, likely some fish and vegetables, and no meat whatsoever. That list shrunk even further during Lent, when the brothers fasted during the 40 days leading up to Easter. Enter maultaschen. According to local legend, an enterprising monk figured that if he tucked herbs, cheese, and ground meat into a pocket of pasta dough and sealed it, it would be safely hidden from God’s eyes. With this audacious tale, maultaschen (singular: maultasche) were born, as was their sacrilicious nickname “herrgottsbescheißerle,” which means “little God-cheaters.” To this day, when diners in the area around maulbronn are supposedly refraining from meat for Lent, they’ll supplement their diet with maultaschen, and the dish is now ubiquitous throughout Germany. Our guide, Barbara Gittinger, has worked in Maulbronn Monastery’s administration for a decade, so she walked us entertainingly through the many stories, dubious and otherwise, that crop up in an institution nearly 1,000 years old. Gittinger also led our maultaschen-making session, which—fair warning—is normally reserved for groups of 20 or more. The dish is pretty simple, though, especially if you’ve ever worked with similar dishes like ravioli using dough that’s quite forgiving. To make it even quicker, you can buy premade sheets of pasta dough and incorporate precooked ham, like we did, to eliminate most food-safety concerns about properly handling and cooking raw meats. I’ll definitely make these at home with different combinations of fillings, and might roll out my own pasta. It also helps to have a second person portioning out the filling on the pasta sheets while you close and crimp them, so you can work quickly enough to keep the dough from sticking to the table and get the right amount of filling in each. If you overdo it, you’ll have trouble sealing the pockets, and may lose some of the delicious innards when you drop the maultaschen in simmering broth. In truth, our DIY dumplings weren’t the best maultaschen we ate on the trip—those were at Weinstube Hottum, a cozy restaurant and wine bar in Mainz—but along with a bowl of tangy potato salad and a bottle of dry Amboss Riesling made at nearby winery In der Schmiede, our herrgottbescheißerle were a perfect way to taste the history of the site. With the diplomas Gittinger printed for us, we’re now certified experts in cheating God, just a little. If you can visit the monastery, you should also patronize the nearby butcher shop, Fritz Bromm, which sells vacuum-sealed, ready-to-cook packages of prepared maultaschen. Of course, we forgot they still need to be refrigerated, which meant by the time we were repacking luggage for the trip home a week later, the maultaschen we’d bought to go had gone off. Not everything ages as gracefully as Maulbronn Monastery. Soak the bread in a bowl of cold water for a few minutes. Squeeze liquid out of the bread roll, then mix with chopped onions, leek, ham, and shredded cheese in a bowl. Season to taste with pepper and salt. Roll out the pasta dough on the table (on wax or parchment paper if you prefer) and, using a ruler, cut it with a knife into rectangles (7 cm x 12.5 cm). In a bowl, beat the egg and brush it heavily onto the pasta dough. It will act as a glue to keep the maultaschen shut. Take a small spoon and put a bit of filling on each rectangle, leaving enough room to seal the maultaschen afterwards. Fold each rectangle in half lengthwise, then use a fork to press the dough together at the three exposed edges. Make sure each is completely sealed or you’ll lose the filling when the maultaschen hit the hot broth. Bring broth of your choice to a simmer, not a boil, and cook maultaschen 12 to 15 minutes before removing with a slotted spoon. Serve the maultaschen in bowls or deep plates with some broth alongside potato salad and a glass of German wine.